Have you noticed that if you play a game in Windows Vista it seems to underperform compared to running the same game in Windows XP? You’re not the only one. Windows Vista has a much steeper dependency on the graphics subsystem than Windows XP does mainly due to the behemoth that is the Vista Aero interface. Basically if you’re unsure what this is, its basically an improved version of the basic windows interface enabling graphics effects such as the transparent window borders (glass) and flip 3D (Win+Tab) among other things. When you want to play a game, you don’t need to use these things and you really want your graphics card to be focused primarily on the game at hand, instead of having to juggle the two. To improve the performance of your games in windows vista, just turn off the Aero interface when you play a game. 2). 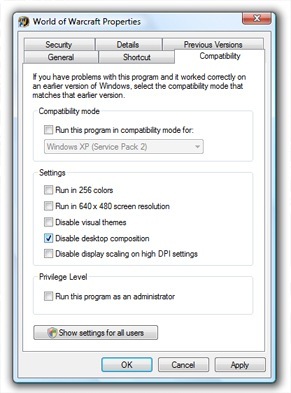 Click the ‘Compatibility’ Tab and check the “Disable desktop composition” setting. The next time you run your game, the windows aero interface will be disabled while you play your game. I originally didn’t think this would really make much difference when playing games (and it won’t for older games) but I’ve seen an increase of maybe 10-15% on frame rates in many newer games on my computer so its a small tip, but definitely a worthy one.